CNC-4V system, Catch region. On the 19th of December at 9:20 EVE Standard Time, Tactical Supremacy [TIKLE] and Dangerous Voltage [-DV-] clashed head on with Stain-Wagon (SW) coalition in the system. The battle was started by SW forces who were busy reinforcing infrastructure held by Tactical Supremacy and its ally Dangerous Voltage. This was part of a new offensive launched by the coalition against the two alliances which it views as squatters. The SW fleet, a Rattlesnake battleship fleet with moderate capital support numbering an estimated 60 pilots, had set up in the CNC-4V system on the infrastructure hub and was busy entosising it when it was spotted by Tactical Supremacy fleet commanders. With the SW fleet already set up and having deployed interdiction warp probes around itself, particularly in the direction of the Tactical Supremacy Fortizar citadel, it seemed that the risk of the locals successfully engaging was diminished. Not despairing, Tactical Supremacy formed a 50 pilot Rattlesnake fleet of its own and waited in its citadel while its fleet commander secured a warp in on the grid. Seeing this, SW started aligning towards a friendly citadel in the system, seemingly preferring to avoid an engagement. Tactical Supremacy fleet commanders altered their plan and decided to try and ensnare the SW force auxiliaries as their fleet warped to the citadel. A couple of interdictors were prepared to warp in while a covert ops ship closed in cloaked on the unsuspecting SW capitals, securing a stealthy warp in. Finally with the infrastructure hub entering its reinforced mode, the SW forces started warping out. Pouncing, the interdictors warped in and burned straight at the force auxiliaries, launching interdiction probes and pinning two on the grid. With the SW fleet already off the grid, the force auxiliaries could do very little as the interdiction warp probes engulfed them. Tactical Supremacy warped its fleet on top of the force auxiliaries and started engaging the ships. First to go down was the Apostle, the missile salvos and drone fire chewing through its thick armor and finally overcoming it. As it blew up, SW forces returned to the field, warping in 100 kilometers off of the Tactical Supremacy fleet and remaining there. Missile salvos and drone fire started hitting the Tactical Supremacy Rattlesnakes, but their shields held against the SW barrages. With its logistics wing managing to handle the incoming damage just fine, the Tactical Supremacy fleet focused its attention on the still tackled Minokawa force auxiliary. Concentrating its fire, the fleet started to pummel the capital ship. For nearly 6 minutes the Minokawa resisted, its shields absorbing much of the incoming fire. However as time wore on, it faltered and the Rattlesnakes’ missiles managed to penetrate through and explode against its hull. It died in a flash of bright light. It was at this point that things got out of hand. The SW fleet was unable to break the tank of the Tactical Supremacy Rattlesnakes, and having lost 2 force auxiliaries, they decided to escalate. A cynosural beacon lit up and a Wyvern super carrier suddenly entered the field, landing above the fray. Seeing a Wyvern perched above the maelstrom surprised the Tactical Supremacy fleet commanders. Recovering quickly, interdictors were sent after it, several of the ships warping to the visible cynosural beacon and launching their warp disruption probes. The behemoth was trapped on the field. Immediately, dreadnoughts and carriers organized to take on the super carrier as Tactical Supremacy prepared to take on the Wyvern. Dangerous Voltage already had a dreadnought squadron prepared in range of the system, and Tactical Supremacy hurried to light up a cynosural beacon on top of the tackled super carrier. At the same time, the Tactical Supremacy capital squadron jumped out of the system to a friendly citadel, rather than warp in and get stuck out of range by warp disruption probes. With the cynosural beacon lit, the Dangerous Voltage capitals landed on the grid and surrounded the tackled Wyvern. The Dreadnoughts entered siege cycles while carriers let loose fighter squadrons. Within moments, capital turrets opened fire on the super carrier, bombarding it mainly with 2500mm autocannons. The Dangerous Voltage capital squadron was soon reinforced by the Tactical Supremacy squadron, resulting in nearly 20 capitals tearing into the Wyvern. SW forces, surprised by the appearance of the Wyvern themselves, attempted to help their tackled brethren. They warped to it the Wyvern’s position and targeted the hostile dreadnoughts, concentrating their firepower, but to no avail. Within moments, the Wyvern was overwhelmed, its shields gone and its relatively fragile hull shredded by the many dreadnoughts surrounding it. It caved in to the assault, a series of explosions tearing apart its tortured hull and leaving behind nothing but a wreck. With the Wyvern gone, Tactical Supremacy and Dangerous Voltage turned their attention to the SW capitals attacking them. An ugly brawl broke out as the two sides fought in close range, dreadnoughts and carriers concentrating their immense firepower and wailing on each other. As the battle raged on, it became apparent that Tactical Supremacy and Dangerous Voltage held the advantage, both in number of capitals and in firepower. The SW capital force was soon in ruins, carriers and dreadnoughts torn asunder, their wrecks joining those of their ill fated Wyvern. Examination of the wrecks shows that most of the SW dreadnoughts were fitted to combat sub capitals, thus their firepower was far lower than their Tactical Supremacy and Dangerous Voltage counterparts. That said, SW managed to inflict some casualties in return. As the SW carriers and dreadnoughts went down, they managed to take with them 2 of the Tactical Supremacy and Dangerous Voltage dreadnoughts. Every minute saw another capital dispatched as the two sides continued to battle. Finally, the two alliances managed to secure their victory by destroying the remaining force auxiliaries of SW. With the force auxiliaries gone, the SW Rattlesnake force lost its logistics backbone and was extremely vulnerable. Interdictors kept launching new warp disruption probes on the field as the clash continued. This spelled doom to the SW forces, as their losses mounted and their logistics wing was destroyed. As the number of surviving SW capitals diminished, Tactical Supremacy started focusing on the SW Rattlensakes. With no logistics ships to speak of, the battleships could do nothing to tank the incoming damage. Battleships fell, overwhelmed by coordinated missile fire. SW realized the battle was lost and quickly gave the order for the remaining ships to retreat. Rattlesnakes cycled their micro jump drives and teleported away from the fight, warping off immediately once they cleared the cover of the warp interdiction probes. What capitals still remained made emergency jumps out of the system or managed to warp out to safe citadels and remained there, not wishing to try their luck. Tactical Supremacy and Dangerous Voltage were left to claim the field. The two alliances quickly dispatched whatever stragglers remained before salvaging the field and looting whatever was left of the Wyvern and the SW capital force. Once the field had been scoured for useful parts, the two alliances extracted their remaining capitals, having achieved victory. With this, the battle of CNC-4V came to an end. Battle report for the CNC-4V system can be found here. The battle raged for 18 minutes with the system hosting according to Tactical Supremacy commanders only 130 pilots at the peak of the fighting and no Time Dilation reported. Tactical Supremacy and Dangerous Voltage suffered minor losses in the battle, a total of 18 ships including 2 dreadnoughts with the rest being mostly interdictors. 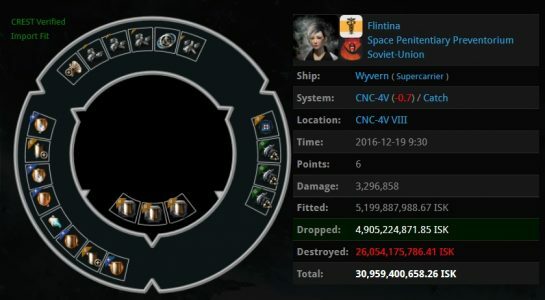 The ISK damage is measured at 9.81 billion ISK. 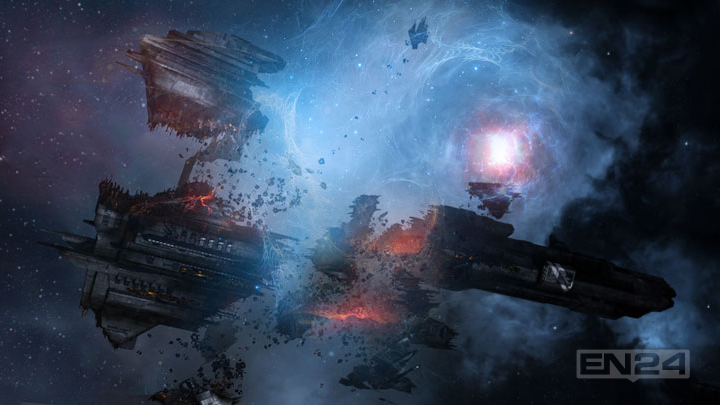 Compared to the two alliances, SW forces suffered grave losses, 24 ships including 1 super carrier, 5 dreadnoughts, 4 force auxiliary, 5 carriers and 2 battleships for a total sum of 68.5 billion ISK damage. justification appeared to be at the internet the simplest thing to take note of. exploited with the familiarity of one’s favorite sports teams. Thanks to my father who stated to me regarding this webpage, this webpage is genuinely awesome. So get buying t-shirts on-line at Bewakoof.